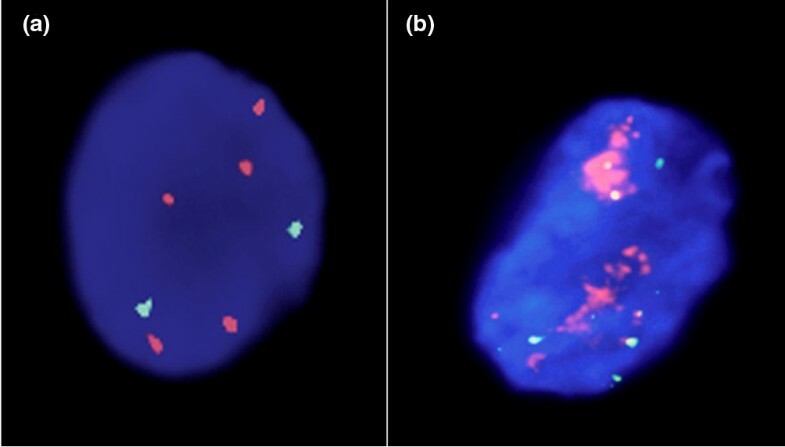 Using fluorescence in situ hybridization (FISH), we previously showed that the LRIG1 gene had an increased copy number in 11 of 28 (39%) breast cancer tumours . The LRIG1 gene (leucine-rich repeats and immunoglobulin-like domains 1) at chromosome 3p14 is a proposed tumour suppressor gene that negatively regulates various receptor tyrosine kinases, including the breast cancer proto-oncogene product ERBB2 [2, 3]. Recently, however, Miller and colleagues  showed that 10 of 13 (76%) ERBB2+ tumours had decreased LRIG1 protein levels compared to normal breast tissue. As their data showed down-regulation at the protein level whereas our data showed an increased copy number at the genomic level, we analysed 45 additional breast tumours by FISH as previously described . Thus, out of 73 tumours analysed to date, 25 (34%) did indeed have increased LRIG1 copy number. To further analyse the relationship between LRIG1 and ERBB2 at the genomic level, we evaluated the ERBB2 gene copy numbers in 18 tumours with increased LRIG1 copy number using FISH analysis according to standard procedures. Interestingly, 16 (89%) out of the 18 tumours displayed increased copy number of ERBB2 (Figure 1). This suggests that the majority of breast cancer tumours with increased copy number of ERBB2 simultaneously had increased LRIG1 copy number (our data) and decreased LRIG1 protein levels . Increased copy number of LRIG1 and ERBB2 in human breast cancer in the same patient. Interphase nuclei from a breast cancer tumour were analysed by FISH. (a) A specific LRIG1 probe (red) showed increased LRIG1 copy number (five copies) whereas a specific centromere probe (CEP3) (green) showed normal chromosome 3 copy number (two copies). (b) A specific ERBB2 probe (red) showed amplification of the ERBB2 gene whereas a specific centromere probe (CEP17; green) showed three copies of chromosomes 17. We draw the following major conclusions from these results. First, as previously shown, a significant proportion of breast tumours have an increased LRIG1 gene dosage. Second, there is a correlation between increased gene copy numbers of ERBB2 and LRIG1. Third, based on the Miller protein data, most of the tumours with increased LRIG1 gene dosage express reduced levels of the LRIG1 protein. This indicates a negative selection against LRIG1 protein expression, supporting the notion that LRIG1 is a tumour suppressor in breast cancer. Although the mechanism behind the down-regulation of LRIG1 protein in breast cancer is not known, it has been reported that increased gene copy numbers in some cases are associated with decreased mRNA expression . In any case, the high frequency (34%) of tumours with increased LRIG1 gene copy number implies a positive selection for tumour cells with this genomic alteration. It remains, however, to be elucidated whether the molecular driver behind the selective advantage associated with this alteration is LRIG1 down-regulation per se. Other possibilities include activation of nearby proto-oncogenes or the generation of novel oncogenic fusion genes. In summary, the co-incidental increase in copy number of ERBB2 and LRIG1 in breast cancer is a novel finding, pointing at a functional co-operation between these genetic events, where the biological and clinical importance need to be clarified further.